A revisionist history: Sure, I work for the CIA. It’s day two of the #15Habits workshop. Today’s habit: Believe. People who know me well, know that I don’t have normal sleeping habits. I rarely sleep through the night, and often I’m up at 3AM. So, the most difficult part of this challenge to wake up two hours earlier than normal and just get to writing was trying to figure out what time two hours early would be! I decided to make that time the 3:00-3:30ish AM time that I generally wake up, but typically I’m not really productive. Today, I made myself be productive. But, what to write about at 3:30AM? The sun wasn’t coming up, so I’m not writing about a beautiful sunrise. My dogs weren’t even up, so I wasn’t going to be writing about their antics. Honestly, what’s most fresh in my mind is my dream from last night. So, I originally wrote about my dream – but frankly, I wasn’t impressed with my story. My dreams last night were not some of my more amusing dreams. When I got home tonight, I had a text from my god-daughters’ dad, Todd. College football related, of course! In fact, today, like many other days I had several conversations about college football. Our CEO and I talk CFB every time we see each other. Coworkers in other departments know that they can come to me, IM me, or chat CFB over a game of ping pong whenever our schedules allow. I am THAT GIRL. The text I received today was a plea for me to come to Ohio for opening weekend of college football, and the reason was two-fold. 1) my friend (whom I’ve known since kindergarten) has apparently made improvements to his “man cave” – a cave which already had boasted 3 TVs, over 3,000 DVDs of previous games, multiple mini-stadium replicas, helmets, banners and other paraphernalia on the walls. Now, I don’t fault him for being a UofM fan (“Go Blue”, and all that crap), but I do insist that his daughters, my god-daughters, learn to love Clemson as well. And 2), he told me that Lauren, (the beautiful long-blonde-haired, big blue-eyed, eldest – all of a kindergartener/first grader this year – girl), and Lindsey (the younger one, equally beautiful, blonde-haired, big blue-eyed girl with a personality that is purely her dad’s side of the family!) would “love it” if Auntie Kerri came to visit. Lauren, in fact, swore at one point that she is a future Tiger! Completely warmed my heart! I could tell you a dozen amusing stories about that girl – half princess / half “Auntie Kerri-like tomboy”. She knows and loves both her Disney princesses and her college football! In fact, in 2011, during the spring game at UofM, she ran into the stadium (on her own) singing “Hail to the Victors”, at the top of her lungs. Cutest danged thing I’ve ever seen! And, she and Lindsey both don the Clemson helmet for pictures during CFB season. They both have number “7” (Ricky Sapp – and others!) jerseys, and both have Clemson cheer uniforms, Cutie Patutus outfits, etc. But, I digress. Aside from the reason for the text, I was immediately taken back several years, when Lauren was just a baby. I was working for Avery Dennison in Ohio, and I was traveling anywhere from 50-80% of the time. I could barely keep up with where I was, or where I was going to be, let alone allowing my friends to keep track of me! So, Todd, and his dearly departed dad, Larry, created this conspiracy theory about me. Because I was traveling so much, and because they were just as big of fans of the aforementioned show as I was, Todd and Larry decided that I MUST be working for the government, undercover – ala Sydney Bristow (heroine of “Alias”). It was a running joke for quite some time. And, when Lauren was born, I even created an email account named “mountaineer_in_training” (“mountaineer” was Sydney Bristow’s code name on the show) to send messages to her. I played the game with them. And, we all had a great deal of fun with it. Then, one day, I found myself connecting through BWI (Baltimore-Washington International) airport. I don’t remember where I was coming from, or why I was there, but there I was! And, as I was walking through the terminal, staring back at me was a rack of ball caps embroidered with “FBI” text. 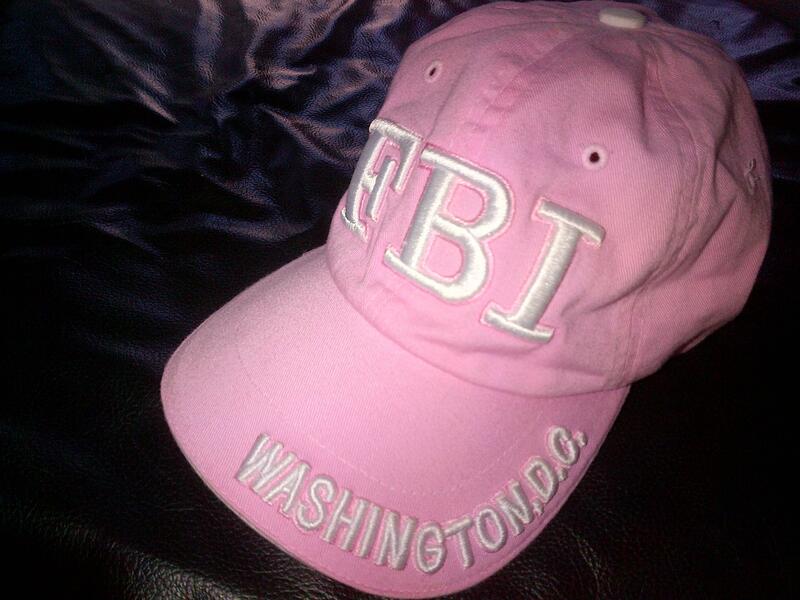 The pink FBI cap for Lauren. Now, I know that Sydney was CIA, but this was close enough. I bought a couple of items from the gift shop (including that pink “FBI” cap). Upon returning to Ohio, I drove ~20 miles to Lauren’s house, left a gift bag of “government goodies” on the door – no note, no phone call to tell anyone about it, nothing, and I waited. The reaction I received from Todd (and later from Larry) was priceless! Their version of Kerri Kilbourne as Sydney Bristow had finally revealed itself (though still unofficially). This was an epic “well-played, Auntie Kerri” moment! Todd and Larry talked about my “secret drop” for years! And, incidentally, years later, when Osama Bin Laden was assassinated, I received undue credit from my friends. I played no part in that mission – God bless and applaud the men and women who did – but it was a reasonable continuation of the jokes we had been trading. I realized tonight that since I have not been traveling nearly as much as I was during that timeframe, I have really lagged in my “adventuresome, interesting, ‘If I tell you, I’ll have to kill you’, super-spy” persona. I think it’s time to tap back into that girl’s personality! Just because Sydney Bristow no longer actively chases down international criminals doesn’t mean that I can’t pretend to! I BELIEVE that I can keep up a fascinating alter-ego. I BELIEVE that I am capable of continuing an interesting life. I BELIEVE that my god-daughters will continue to love and look up to me. And, I BELIEVE that I am a writer. Do you? What sort of alter-ego do you have? First, she has transferred to 3 different colleges and has lived in South Carolina, New York, Ohio, California, and Michigan. That’s more than everyone else I know COMBINED. Second, when ever major operations occur, she is mysteriously “out of town” and unavailable to talk or text. When KSM (Khalid Sheikh Mohammed) was taken into custody, she was “out of town”. When Al-Zarkawi was killed, she was “out of town”. When Uday & Qusay Hussein were killed, she was “out of town”. Now, if you are a CEO of a multi-national corporation, that’s not that unusual. However, it becomes a little suspicious when you’re an engineer or social media marketing developer to constantly be traveling and “out of town”exactly at the time of major national security operations (there were literally more too, but I can’t remember them all). I mean, the social media world exists in binary code. How much travel to how many cities could POSSIBLY be necessary to develop a social media marketing strategy? Do the companies she has worked for not have phones? No conference call capabilities? No cell phones? No e-mail? No video conferencing? Todd, I can’t believe you want to blow my cover! I had actually forgotten how you and Larry documented my (un)whereabouts during major operations throughout the years. This comment brought a smile to my face. Thanks!